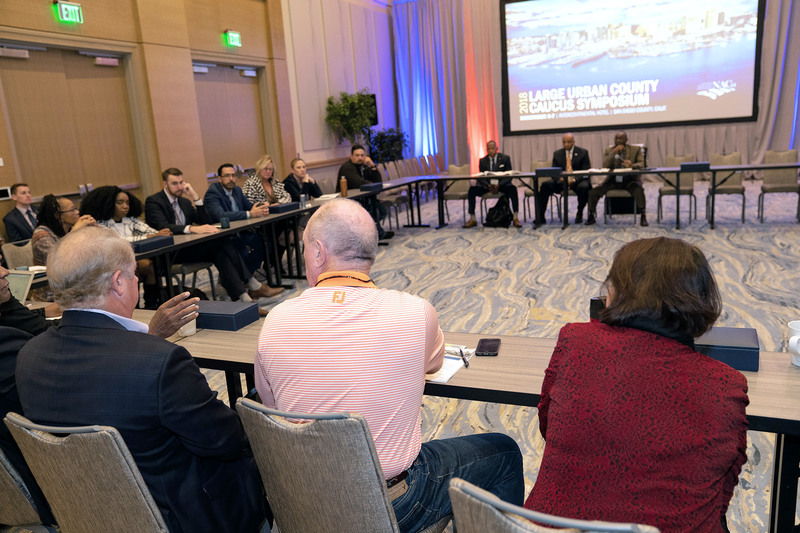 In November 2018, members of the National Association of Counties’ (NACo) Large Urban County Caucus (LUCC) gathered for the annual LUCC Symposium in San Diego County (Calif.). The annual LUCC Symposium facilitates the exchange of knowledge and solutions that enhance the operations of America’s 131 metropolitan counties. Urban counties in the United States serve more than 156 million county residents daily—which represents nearly half of the 325.7 million county residents. Urban counties are run by 1.8 million employees and have $388.9 billion in operations expenditures annually. LUCC is the leading forum for urban county leaders and is the voice for America’s metropolitan counties before Congress and the Administration. 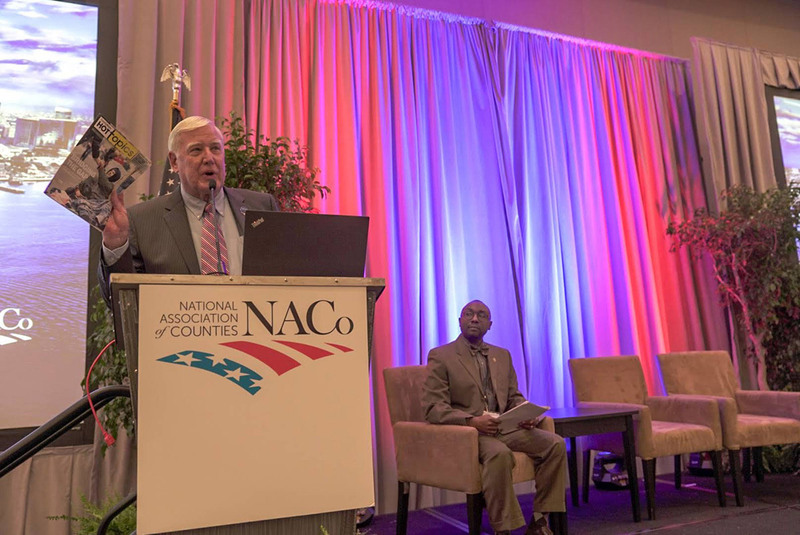 Connecting the Unconnected served as the theme for the 2018 symposium, supporting the 2018-19 NACo President’s initiative developed under the leadership of the current NACo President, Hon. Greg Cox, Supervisor, San Diego County. The Initiative explores ways that county governments are connecting residents in the spirit of build­ing healthy, safe and vibrant communities. The plenary and breakout sessions engaged participants in discussions on how to advance these goals in the context of public health and issues related to youth violence. Representatives from the U.S. Centers for Disease Control and Prevention (CDC), Children’s Initiative and Homeboy Industries joined county officials in discussing their experiences and concerns. Officials from Dallas County (Texas), San Diego County and Suffolk County (N.Y.) participated in panel discussions. Attendees had the opportunity to continue discussions on either topic in breakout sessions following initial panel presentations. This report summa­rizes those discussions and provides some key takeaways for county leaders seeking to address similar issues. Over the past two years the CDC has sent experts into the field more than 750 times to respond to disease outbreaks and other health threats.1 During this session Michelle Van Handel, Acting Associate Director, Program and Performance Improvement Office, National Center for HIV/AIDS, Viral Hepatitis, STD and TB Prevention, CDC shared that the agency’s role is to provide techni­cal assistance and subject matter expertise to support efforts happening in counties across the country. CDC responds rapidly with effective programs, communi­cation and policy with multisectoral partnerships that include law enforcement, schools and other entities. One of the most critical aspects of these efforts is to address stigma associated with the outbreak of some diseases by building trust and truthfully outlining a plan for response and prevention that helps reduce residents’ fear. 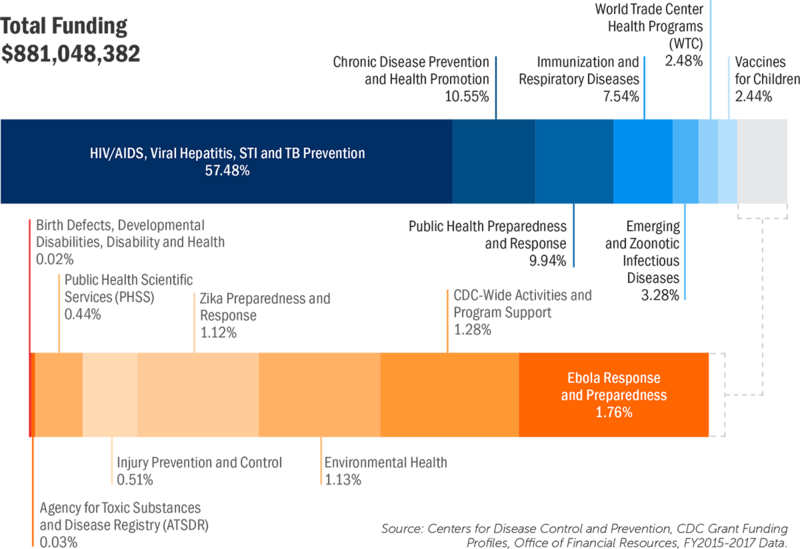 The CDC deploys a diverse set of tools to respond to various health threats. For example, the agency works to remove barriers to administering vaccinations that pre­vent the spread of diseases. Early identification of cases of tuberculosis and hepatitis using modern surveillance technology also helps reduce the overall impact of an outbreak. Monitoring new HIV and hepatitis C infections that are linked to the opioid crisis allows the agency to develop new strategies for disease prevention. The CDC leverages these tools, as well as other resources and technical assistance in partnership with counties and other state and local governments. Hon. Clay Jenkins, County Judge, Dallas County, Texas spoke about his recent experience managing two seri­ous disease outbreaks that threatened the well-being of residents. In 2012, 200 people were infected by the West Nile Virus that resulted in at least 10 deaths.2 At least three residents were infected with the Ebola Virus resulting in one fatality in 2014.3 In both outbreaks, the county government was responsible for declaring an emergency under state law and played a significant role in eliminating these threats on behalf of residents who were at risk of infection. In response to the Ebola outbreak, county leadership organized the Dallas County Ebola Response Team housed in the Department of Health and Human Services. Led by Dr. Wendy Chung, the county’s chief epidemiol­ogist, the team tracked and monitored infected patients and those who may also have been in contact with the virus. A report published by the CDC outlined steps that were taken to contain the outbreak.4 In accordance with CDC recommendations, the team conducted technical consultations with five Dallas area hospitals. An emergency medical services transportation plan for known suspected Ebola patients was established. In addition, the team increased testing capacity, established a triage unit and implemented further measures to contain potential contacts with the virus. As part of the report, the response team identified rec­ommendations on how other jurisdictions can better plan for a potential Ebola outbreak.5 First, the team provided public education programming for hospitals where personnel are positioned to immediately iden­tify an Ebola infection. The utilization of methodology that is known to be effective in monitoring infections and tracking potential contacts will reduce the overall risk of exposure. An ongoing effort to assess infection control practices and conduct trainings can better equip personnel to counter future threats. Designation of facilities for patient care and, relatedly, protocols to safely transport those who might be infected with the virus can also improve outcomes for a county’s efforts to contain and eliminate an Ebola outbreak. The County Judge’s Office monitored the response team’s efforts, shaped and implemented a communications strategy and coordinated with external partners to stop the spread of the disease. Identification of a spokesperson allowed for dissemination of consistent messaging that reduced the public’s anxiety and fear about the outbreak. The Judge’s team created a whiteboard strategy that mapped out relevant community assets, as well as plans to address issues as they were raised and to illustrate the county’s role relative to part­ner jurisdictions that included state government and the CDC. These efforts resulted in the containment of the Ebola virus and the end of the threat. Following the Judge’s presentation, Nick Macchione, Director of Health and Human Services, San Diego County, Calif. provided an overview of efforts he led to combat the spread of hundreds of cases of Hepatitis A infections that also resulted in the declaration of a local public emergency. Between March 6, 2017, when the increase in hepatitis cases was first reported, and January 23, 2018, the day the public health emergency declaration ended, San Diego County administered 121,921 vaccinations in just 2,538 vaccination events.7 County nurses ran 833 mass vaccination drives on-site at locations where people experiencing homeless­ness frequent, including homeless services providers, hotels, parks and libraries. In response to the severity of the outbreak, a coordi­nation team was established to execute a plan with effective intervention and prevention strategies. A pub­lic education campaign was implemented to inform residents of the importance of receiving vaccinations and instructions on how they could access services. The county’s 2-1-1 system was leveraged to create a resource sharing hub on the outbreak. Informational materials, posters and other publications were dis­played throughout the county at high traffic sites to better connect residents to services. The county made hand washing stations available to all. The Health Department distributed hygiene kits and enhanced efforts to inspect food. Although transient populations face transportation barriers to visiting public health clinics, are less likely to live in sanitary environments and often come in close contact with infected persons, knowledge gaps in literature initially limited county efforts. For exam­ple, the CDC had not previously identified people experiencing homelessness as a subgroup that is recommended to receive Hepatitis A vaccinations.8 County officials consulted federal data sources from the U.S. Census Bureau American Community Survey and the Substance Abuse and Mental Health Services Administration, as well as local research­ers at University of California San Diego Division of Infectious Diseases and Global Public Health to develop evidence-based recommendations to con­tain the outbreak. – Nick Macchione, Director of Health and Human Services, San Diego County, Calif.
Armed with data and a healthy supply of vaccines, county officials collaborated with homeless services providers, faith-based organizations and substance use providers to more effectively deliver vaccina­tions to at-risk populations. Partnerships of nurses, social service providers and public safety officials led 80 events that delivered vaccinations via mobile vans and formed 1,625 “foot teams” to educate and reach individuals in difficult-to-reach areas, including encampments, rivers, canyons and ravines. 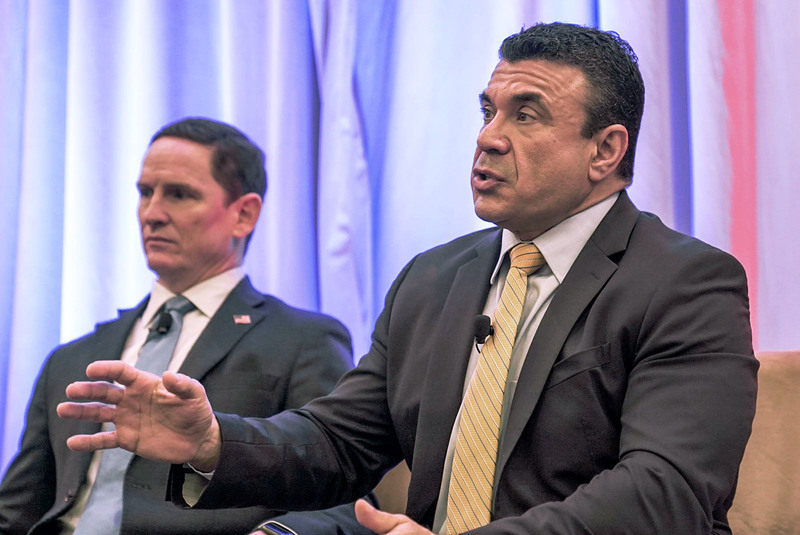 “The response demonstrates how creative counties can be in developing solutions,” said Nick Macchione, Director of Health and Human Services, San Diego County during the 2018 LUCC Symposium. According to a report from the U.S. Department of Justice, juvenile courts across the country handled nearly 975,000 delinquency cases for juveniles with criminal law violations in 2014.9 Recognizing the ongo­ing significance of this issue to communities across the country, the Large Urban County Caucus (LUCC) hosted a session on curbing youth violence at the 2018 Symposium. During this session, representatives of Homeboy Industries, the Children’s Initiative and Suffolk County, N.Y. all shared advice on how county leaders can address violence by connecting youth to services they need. Homeboy Industries, based in Los Angeles County (Calif.), serves over 10,000 former gang members each year. The organization offers tattoo removal, anger management counseling, parenting classes, job training and a community that recognizes the value of individu­ality, among other services. It presents an alternative to incarceration by investing in former gang members and helping them achieve their full potential beyond their former involvement with the justice system. Representing Homeboy Industries, Hugo Gonzalez, an alumnus of the program, brought insights from his own experience as a former gang member who had been incarcerated for 18 years. He shared that one of the principal drivers of youth violence is a lack of love and compassion provided by a stable family structure. Mr. Gonzalez explained that people often become involved with a gang because of some painful experi­ence they had in the past, which disconnected them from their family and from society. A gang can be like a family, providing acceptance to those who longed for it. In developing solutions, Mr. Gonzalez stressed the importance of first and foremost viewing each person as a human being, not as a problem and establishing trust with them. This connection is especially important when working with children, who tend to relate best to others who have experienced similar situations and overcome their pain. Sandra McBrayer, CEO, Children’s Initiative added to the discussion from her experience managing the organi­zations programs that seek to end youth violence. The Children’s Initiative serves low-income children, youth and families in San Diego County (Calif.). It focuses on developing policies and programs to promote health, education, safety and economic security for children across the country. She emphasized the importance of utilizing data to develop and implement the best possible services for residents. County leaders can map data on youth crime, teen pregnancies and other indicators to decide which areas to target with county services. Intergenerational programs are especially effective, since many youth who are involved in criminal activity lack positive men­tors. Case managers must build strong relationships and look to address the root causes of why a young person became involved in criminal activity. Hon. Errol D. Toulon, County Sherriff, Suffolk County, N.Y., brought his perspective from over 30 years of crim­inal justice experience. Under his leadership, the goal of his Office has been to deconstruct the prison pipeline. by addressing the root causes of youth violence. The county is working to identify school districts with high rates of crime, then individuals and households that will benefit from case management services. The Sheriff is also training police officers as counselors, so they are better able to do their jobs and reduce the number of youths who are arrested. By implementing this program with officers, the county has been able to help build mentor relationships between officers and youth. Aside from Suffolk County’s work to address the root causes of violence and crime among disconnected youth, the county has also revamped its jail system to give inmates opportunities to prepare for opportunity once they are released. An initial step in these reforms was to separate younger inmates who are more likely to exit the cycle of recidivism than older inmates who have already cycled through the justice system many times. The county also implemented a 40-hour work week for inmates. During these times they can learn marketable skills that can help them secure employment when they exit prison. The county also conducts psychological assessments to connect inmates with appropriate men­tal health services. Upon release, the county provides additional services to help inmates find employment and housing. Attendees at the 2018 LUCC Symposium gained valuable insights on how to better address and prevent disease outbreaks and reduce youth violence. Future events will feature opportunities for members to explore additional best practices related to issues of greatest concern to urban counties such as homelessness and affordable housing. LUCC meets at least three times each year at NACo’s Legislative Conference, Annual Conference and Symposium. The caucus will meet next on March 3, 2019 at the Legislative Conference in Washington, DC. Centers for Disease Control and Prevention, “CDC Current Outbreak List” available at www.cdc.gov/outbreaks/index.html (February 8, 2019). Manny Fernandez and Donald G. McNeil Jr., “West Nile Hits hard Around Dallas, With Fear of Its Spread,” The New York Times (2012), available at www.nytimes.com/2012/08/17/us/west-nile-virus-hits-hard-in-dallas-area-and-is-seen-spreading.html (February 8, 2019). Sherry Jacobson, “Ebola Outbreak in Dallas Officially Ends,” Dallas News (2014), available at www.dallasnews.com/news/news/2014/11/06/ebola-outbreak-in-dallas-officially-ends (February 8, 2019). Michelle S. Chevalier et al. “Ebola Virus Disease Cluster in the United States – Dallas County, Texas, 2014,” Morbidity and Mortality Weekly Report, (2014), available at www.ncbi.nlm.nih.gov/pmc/articles/PMC5779510/ (February 8, 2019). 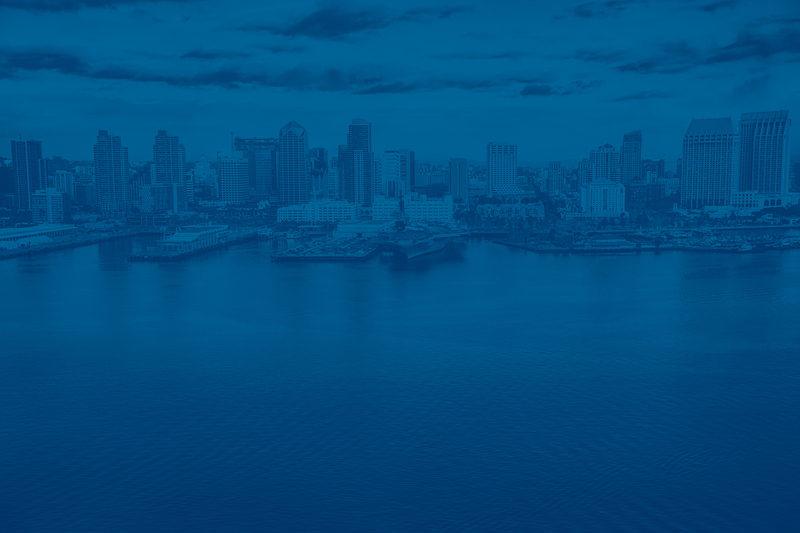 County of San Diego, “Hepatitis A Outbreak After Action Report” (2018) available at https://www.sandiegocounty.gov/content/dam/sdc/cosd/SanDiegoHepatitisAOutbreak-2017-18-AfterActionReport.pdf(February 8, 2019). U.S. Department of Justice, “Delinquency Cases in Juvenile Court, 2014” (2018), available at www.ojjdp.gov/pubs/251107.pdf (February 8, 2019). 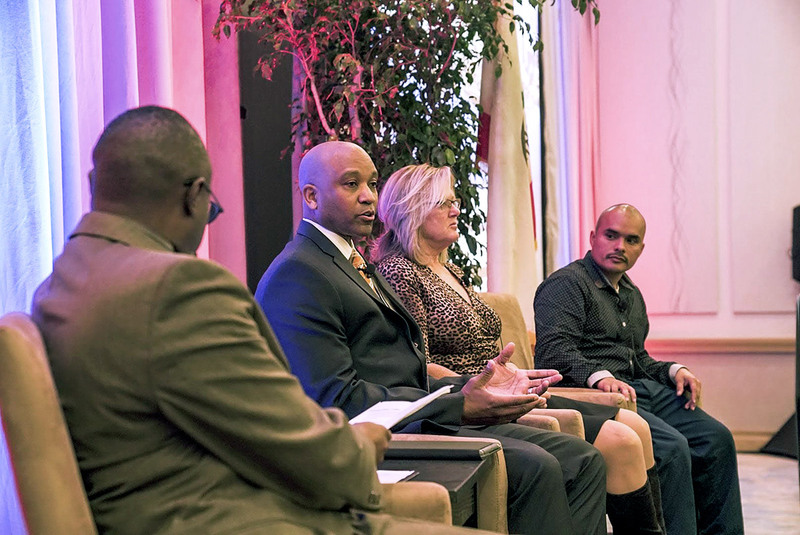 See Mary Ann Barton, “County Officials Talk Curbing Youth Violence at 2018 LUCC Symposium” County News (2018), available at www.naco.org/articles/county-officials-talk-curbing-youth-violence-2018-lucc-symposium (February 8, 2019). LongIsland.com, “Suffolk County Executive Bellone Announces Fresh Start Initiative Assists over 100 Formerly Incarcerated Individuals Find Employment” (2019), available at www.longisland.com/news/01-02-19/suffolk-coun­ty-executive-bellone-announces-fresh-start-initiative-assists-over-100-formerly-incarcerated-individuals-find-em­ployment.html (February 8, 2019). America’s urban counties play a prominent role in the lives of 156 million residents every day. We foster conditions for economic strength, build and maintain transportation systems and critical infrastructure, promote community health and well-being, champion justice and public safety and implement a broad portfolio of federal, state and local programs. The National Association of Counties’ (NACo) Large Urban County Caucus, or “LUCC,” is the leading national body for urban county leaders and is the voice for America’s metropolitan counties before Congress and the Administration. Comprised of county executives, governing board members and other senior elected and appointed officials, LUCC members focus on urban challenges and solutions, engage in peer-to-peer information exchanges and inform national policy discussions. The LUCC Symposium is the premier national forum for the exchange of knowledge and solutions that enhance the operations of America’s 131 metropolitan counties. This year, more than 200 county officials from 93 counties are convening in San Diego County for the 2018 LUCC Symposium. At NACo's Large Urban County Caucus meeting, Sunday, Orange County, Calif. Supervisor Andrew Do emphasizes the importance of collaboration in addressing the issue of homelessness. Photo by Denny Henry. Members of NACo’s Large Urban County Caucus (LUCC) discussed ways they can conquer homelessness at their meeting at NACo’s Legislative Conference. At a large building in San Diego County, rows of desks in cubicles are lined up on the second floor where operators are taking phone calls from residents in need of everything from affordable housing to their next meal. Calmness is key to navigating a public health crisis. But just try telling that to the public. In two recent urban disease outbreaks, county officials had to balance informing residents while not inflaming their fears.